Physics driven forklift demo en training installation. UCAN & GriN partner up to make a really cool simulator. 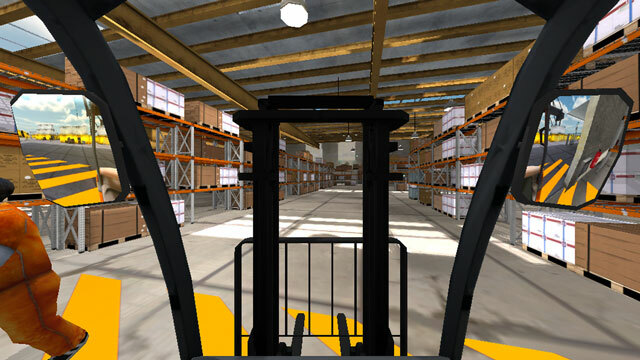 Goal: build an installation that connects controls of a real forklift surrounded by 4 screens to a virtual environment where users can learn how to operate the forklift and take special notice to safety regulations. Driving -- lifting physics -- Proof of Concept. 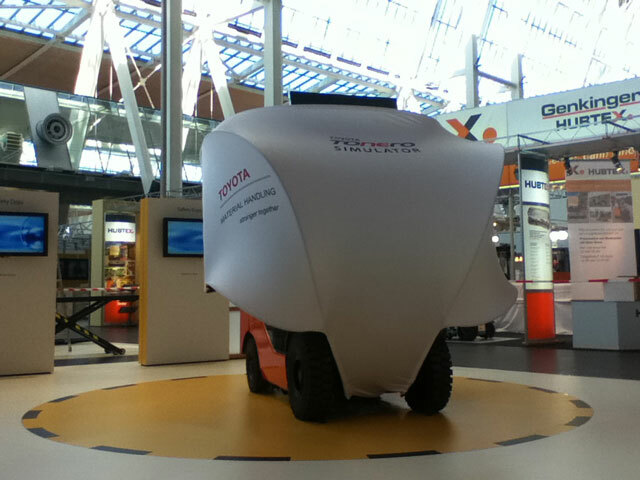 This demonstrator is used to test a physics rig setup with 3 wheels. Most basic functions are working. But we are experiencing some physics problems due to kinetic movement of attached collider objects. Several sollutions come to mind, but most will bypass the 100% physics model we are using now. The main focus is put on ground textures with bump- and specular maps. Baked ambient occlusion on static objects, baked shadowmaps on distant objects and realtime shadow casting for nearby objects. We also added some props in the background, skyline and on the ground of the terrain. Containters have textures, but no normal/bump maps yet. Multi-screen setups have several challenges. First one being that Unity3D will only allow one screen to play the application fullscreen. Typical dual monitor setup will not work fullscreen on both monitors. The most common sollution that is used in professional multiscreen 3D simulators is to have multiple computers render different views. These computers are connected to each other via Local Area Network where one computer does all the physics and processing and the other computers act as mere render windows. To bypass this challenge we have chosen to test the Matrox tripple head 2 Go which actually acts as a very large virtual screen. It splits this large screen over up to 3 monitors allowing resolutions over 5000 pixels wide. Depending on the final render speed of the applications we can use 2 or 3 screens per computer. Ofcourse this means we will still need at least 2 computers to manage 4 screens. Crucial to the succes of this project is that we must be able to connect the forklift controllers to our simulator software. For the initial test, we used a standard joystick steeringwheel with race-pedals setup. This worked perfectly… but… we need 3 pedals, not just two. The third pedal is used to slow down the acceleration, allowing for a much preciser control when driving. Also this particular forklift uses 3 extra axes for movement of the mast (up/down, left/right and tilt). There is also a switch on the tilt controller that will clamp the forks to perfect horizontal position. There is another switch with 3 positions to set the gears (forward/neutral/backwards). Solution? We found this really cool DIY joystick controller board with 8 analog inputs. As most electronics work on 5 volts, we ordered it hoping it would work on the armrest forklift controller. After recieving the armrest controller, we reverse-engineerd the wiring and tried our solution… Eureka! All controls except the tilt limiter switch work perfectly! This switch seems to be a magnetic switch and no matter how we try to connect is, we just don’t get any change in signal… Something to work on! We recieved a 3D model of the forklift we will be using in this simulation. But… the model has over 2 million triangles. Naturally this is totally unusable for realtime rendering. In fact we were having trouble just opening the model in our 3D software. The good thing would be that the model was so details that we would be able to generate fantastic normal/bump maps for our lowpoly version. After all, that was the intention. After closer examination we discoverd the model had a very strange structure, with wield submodels, holes and lots of small errors (some of these could result of porting from Cinema4D to 3DSMAX). Anyway, after 5 days modeling and 3 days normalmapping and texturing, we believe to have a great basis to work with. We still have some cleaning to do on the logo’s and graphic elements on the side of the forklift. The resulting model has about 8.000 triangles. You can also check the live rendered version with orbit cam here. When testing the simulator basics we ran into another problem. It is very hard to percieve depth when trying to aim the fork for lifting pallets. Because this is a crucial element when operating a forklift we must try to find a sollution for this. Using stereo 3D displays could solve this problem. But already a whole lot of new problem arise just by thinking about this. First of all 3D TV screens are not build for verical positioning. Apparently the chimey like cooling technique only works when screens are positioned vertically. A possible solution for this could be attaching a cooling fan to each monitor. Another problem is that we are using a multi-screen setup. We do not have any technical specifications yet, but we think that each screen will have it’s own frequency/switch rate for alternating images (typical to active 3D display types). More reseach on this topic will be required! Driving forward, backwards, transporting cargo from point A to point B. You’ll also notice the environment has changed quite a bit. First integration in real forklift. 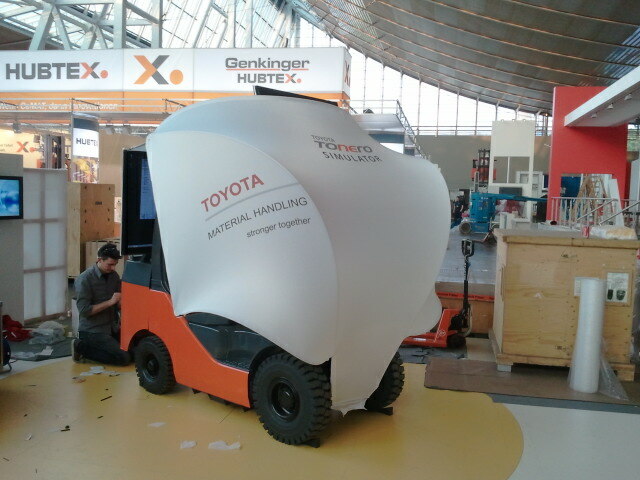 Setting up at CEMAT (Germany). We’ve never really tested the simulator for more than 4 hours at a time. At the CEMAT trade fair it will have to work for 8 hours straight 5 days in a row, with only 1 day to finish testing, bugfixing and minor changes. The first few days we had some technical mechanical difficulties… Steeringwheel failed (got it fixed). Good thing this was always at the end of the day. Also some software stuff needed to be fixed… some errors on our part, but also middleware (#unity3d) was giving some bugs. Surround sound failed all of a sudden (got it fixed). People seem to be really enthusiastic about the simulator… thanks all! While developing, did you collaborate with real forklift instructors to make the look and feel more realistic?